The Branch Line Society ran another of their excellent tours on Saturday 14th January 2017 - the "Vossloh Voyager". 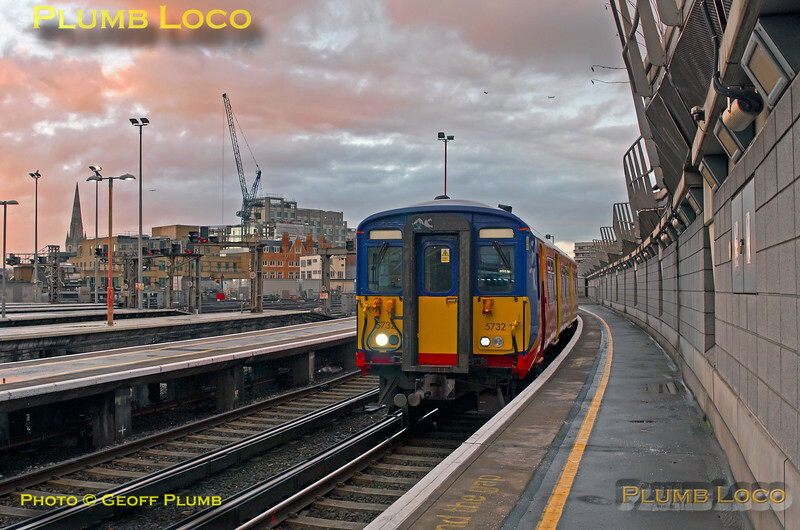 This utilised the two South West Trains Class 455 units that have been the test-beds for the Vossloh Kiepe three phase AC traction motor project. Starting from Waterloo, the tour ran around south west areas of Greater London and raised a great deal of money for SWT's nominated charity, the Railway Benefit Fund. Once again, I was privileged to join the tour in the capacity of "Official Photographer" to record the day's events. Thanks to BLS, South West Trains and Network Rail for another great day out! As usual, a few photos to start, more to add as time permits. The ECS for the BLS "Vossloh Voyager" tour enters Platform 19 at Waterloo station at 08:10¾ on Saturday 14th January 2017, just as the rising sun colours the sky. SWT Units 455 732 and 455 870 are working 5Z45, the 07:51 from Wimbledon Park Depot to form the tour train, 1Z45, departure time 08:40, Wimbledon Park Depot being one of the highlights of the tour to come. Digital Image No. IGMP22416.